It may be that California, where home prices have exploded over the last few years, has jumped the shark when it comes to affordability. CoreLogic's Andrew LePage writes in the company's Insights blog that September home sales in the state were the lowest in the country since September2007. The sales report comes in the wake of reports from several sources showing an abrupt slowdown in home price growth in many of the state's largest metros. CoreLogic says the state's annual gain of 4.1 percent in the median home price statewide was the lowest in more than two years. Coupled with higher mortgages rates, the lack of affordability appears to, in LePage's words, have knocked some would-be buyers to the sidelines, unable or unwilling to buy. Sales do historically fade in September as school starts, and inventories typically shrink. This September there were 33,886 homes sold statewide, a 21.9 percent decline from August sales. The average change from August to September since 2000 has been 9.9 percent. September's sales were down 17.2 percent from September 2017, the largest annual rollback since a 23.3 percent negative change in October 2010. Sales have fallen on an annual basis in four of the last five months. The fifth month, July, saw an annual increase of only 1.2 percent. The author says California's housing slowdown isn't a case of falling demand given its current economic and demographic trends, but a growing lack of affordability and what he calls a gradual shift in buyer psychology. "The sense of urgency among many would-be buyers subsided in recent months as sales slowed and listings rose. Inventory - especially more affordable inventory - remains relatively tight in some markets but many areas have transitioned from a seller's market to a neutral market where neither buyers nor sellers have a distinct advantage." 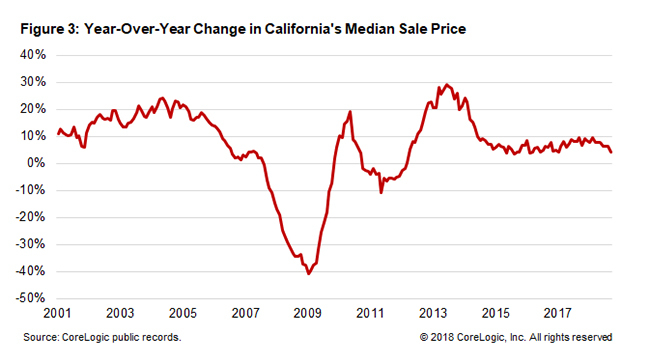 The chart below, showing historical patterns of sales prices in the state since the turn of the century might be a little disturbing to those who remember the housing crisis and recognize that California is often considered to be a harbinger of nationwide trends. However, the overall economics today as well as underwriting standards are quite different than 11 years ago, and many experts have forecast this boom to experience a gradual slowdown in sales and price appreciation rather than any bursting of a bubble. LePage says that none of the state's major regions has escaped the cooldown. The San Francisco Bay area, Sacramento and Central Valley areas, Central Coast and Southern California posted year-over-year sales declines ranging from 15.5 percent to 18.9 percent. Even adjusting for the fact that this September had one less business day for recording sales transaction than the previous one, the annual number is down 13 percent, still one of the largest in several years. 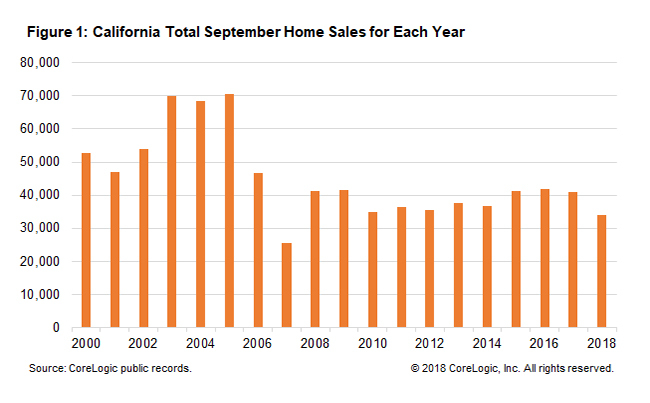 For example, September sales in the six counties that make up the Southern California region September sales were down 17.7 percent year-over-year while prices rose 3.6 percent to a median of $523,000, the smallest annual gain for any month in more than three years. Similarly, sales were down 18.9 percent to a total of 5,970 new and existing homes in the nine counties in San Francisco Bay. The median sale price of $815,000, up 9.3 percent year over year - reflected the smallest annual gain in 15 months. The median price paid for all new and existing houses and condos sold statewide in September 2018 was $485,000, down 1.7 percent from August and up 4.1 percent from September 2017. In nominal terms the median hit an all-time high of $500,000 this June. 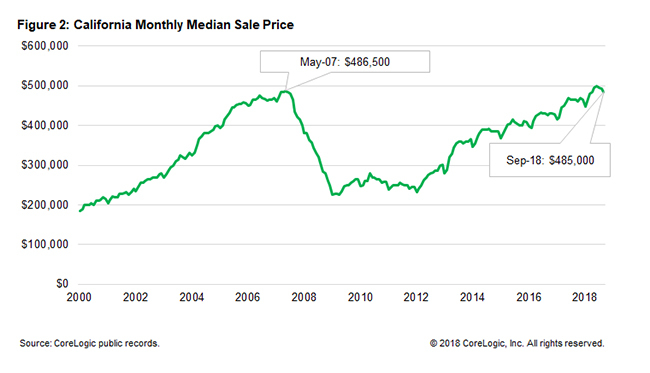 Adjusted for inflation, however, the median has not returned to its pre-housing-bust peak in March 2007, and this September's median was 16.3 percent below that peak. Even with the slowdown in appreciation, the 4.1 percent annual gain was the lowest since June 2016, buyers still face large affordability challenges. The monthly principal and interest payments on a median priced home purchased in September was up three times the rate of appreciation - 12.8 percent - because of approximately an 80 basis point gain in mortgage rates over that period. Soaring sales prices, rapidly rising rates, and higher property taxes were bound to make CA housing unaffordable, it was only a question of when, not if.